« The Wit of Cricket 2. 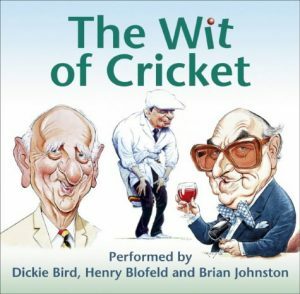 Now available for the first time on one CD and as an audio download, here is a bumper collection of funny stories and anecdotes from the world of cricket as told by three of the game’s all-time great characters – Dickie Bird, Henry Blofeld and Brian Johnston. Recorded live in front of appreciative theatre audiences, here are dozens of hilarious stories about legendary Test cricketers such as Richie Benaud, Ian Botham, Geoffrey Boycott, Michael Holding and Fred Trueman – as well as some of the most famous gaffes and practical jokes carried out by the commentary team on BBC Radio’s Test Match Special. Enjoy three of the best storytellers in the business as they prove that cricket is a funny game – even when rain stops play!